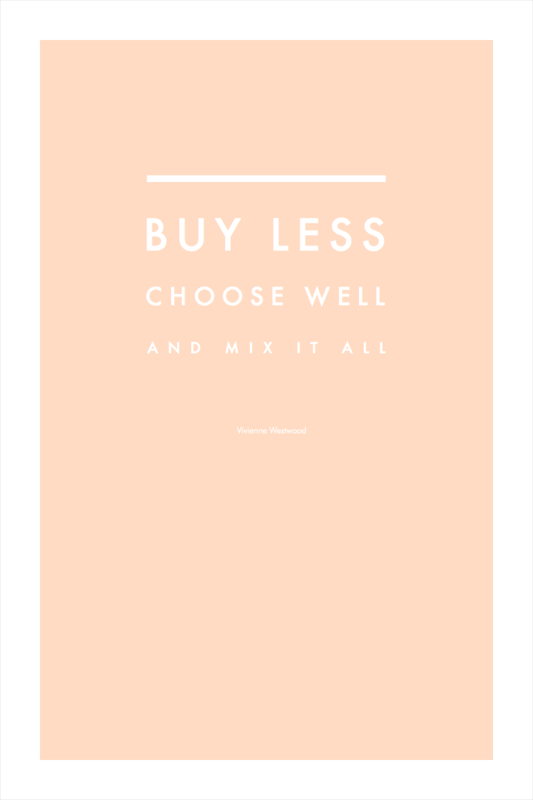 In today's culture we are so bombarded with new products, pretty pictures of these products and clever marketing campaigns, that the simple resolution to "buy less" can be ridiculously tough to stick to. Just like our eating habits, our approach to shopping is something we have been cultivating our whole life and changing it usually requires a good deal of effort and introspection, but it can be done! So, whether you want to declutter and simplify your life, living space or wardrobe, or just be a little more mindful about how you spend your money: In this post we'll first talk about the three most common underlying reasons for overspending to help you identify your own personal triggers. Then in part II I'll show you four practical strategies for avoiding impulse buys, something most people with a tendency to overspend struggle with. Many of us use shopping as a way to manage our emotions: to reduce negative ones and amplify good ones. We reward ourselves with a trip to our favourite store after a big presentation. We shop online after a stressful day at work to relax. We buy stuff we don’t need when we’re anxious, sad or frustrated. We self-soothe and self-pamper. We do this because our body has accepted shopping as an efficient way to trigger the release of dopamine in our brain's reward system. We may feel stressed out but then we enter a shop, browse through all the racks on the look out for something we like and when we do… boom, we feel better, at least for the moment. Over time, that association between buying new stuff and the emotional reward becomes stronger and stronger, until it’s turned into a full-blown habit, and we start craving a "fix" whenever we feel particularly bad or good. For example, if you tend to shop online at night after a long day at work, make a list of things you could do instead in the evenings to relax, like taking a long bubble bath, calling your mom, curling up on the couch with a book, cuddling your cat, etc. The key is to make the decision to do something other than shopping before the trigger happens and have everything prepared for that activity, to make it super easy not to shop once you are in the habit cycle. For many people shopping is also just another fun way to spend the afternoon, evening or weekend. Walking through the city (perhaps with a friend or two), browsing through racks and shelves of stuff, the thrill of finding something you love, building outfits in your head and the anticipation of wearing a new piece for the first time. If you love clothes and see fashion as a way to be creative and express yourself, all of these things are fun for you, just like watching a match live at a stadium is fun for a football fan, or going to the movies is fun for a cinephile. If you love fashion but tend to overspend your budget because of it, try to find ways to have fun with fashion and be creative that don't involve buying something. Get to know your existing wardrobe inside out, experiment, find different ways to wear your old favourites! Spend time defining your unique personal style (Check out this post with 50 creative prompts, styling challenges and thought experiments). Get into fashion illustration, photography or any other creative medium. Swap clothes with friends. Take a class on Skillshare. Or start a blog (on fashion, not shopping)! Some people also shop too much not because it’s fun or stress reliving for them, but to fix a problem. If you are unhappy with your wardrobe or the way you look, buying a new pair of shoes or beauty product is a way of taking charge and solving the problem. If you think your clothes aren’t good, trendy or chic enough, new stuff will make you feel like you are making progress, at least for a little while. Of course, adding more and more pieces onto an already bursting closet without a clear direction will only make it even more difficult to feel confident about your style and build outfits you feel great in. So instead, take a step back and do a little soul searching: Do you lack confidence in general or are you just not sure about your personal style? If it’s the latter, spend a good chunk of time figuring out your style before you buy anything else and then slowly build up a coherent wardrobe that reflects your style, piece-by-piece. If it’s a confidence issue, ignore the whole fashion and style stuff for a while and instead focus on building up your confidence in other areas of your life. Read this post for more thoughts on this topic. The number one thing you can do to avoid impulse buys is this: Decide what you need to buy BEFORE you hit the shops and see what’s available. People who are very prone to shop on impulse do the exact opposite: They go shopping for the sake of it, then they see stuff that looks pretty or interesting and only then they consider if it could be useful to them in some way. Of course, if their brain has already made the connection between new stuff and positive emotions, they will always end up convincing themselves that it really is a good idea to buy that purple statement sweater, multi-function blender or home decor piece. Once the connection is made, it takes a lot of discipline to not give into your brain's clever scheming! Your best strategy to combat this: Keep your brain from getting attached to things you don't need in the first place, by keeping random browsing to a minimum and writing a clear shopping list. The next time before you go shopping, take a couple of minutes to really think about what things you need and which qualities those pieces should have. Define as much as possible and write everything down. For example, if you feel like you need some new clothes for the winter, instead of going straight to your favourite online shop, look through your closet first and figure out which exact pieces you need and what criteria they should fulfil. What colours, materials, details, etc. With your shopping list in hand you can then just scan everything that’s available at a store for things that fit your criteria. Because your brain has a clear target in mind you’ll be much less likely to get distracted by other stuff and therefore also less likely to buy something on impulse. In our culture buying a ton of new stuff every year has become the norm. We are so used to buying new clothes, gadgets and knick knacks all the time, that buying less, repairing what you have instead of replacing it, and putting time and effort into selecting new purchases all seem like foreign concepts. An effective way to reset what you consider normal and gain a new perspective is going on a temporary shopping fast. Don’t buy anything for one whole week and see how you feel. Or: Don’t buy anything new for three months except for food and essentials like shampoo and toilet paper. Alternatively, you can also limit your shopping fast to just one specific group of things you're having have trouble with, your clothes or beauty products for example. Throughout your fast, keep a little diary on your thoughts and feelings, so you can later go back to identify your personal triggers/motivations for wanting to go shop and find effective replacement activities. A pretty easy way to avoid spur-of-the-moment buys is to simply put some time between the impulse and the purchase. If you see something that you like but hadn’t planned on buying, put it on hold for a day. If you still love the item the next day, after having had a chance to really think it through, buy it. For shopping online: Add the item to a wish list or just save the link. When we are about to buy something on impulse, we are usually only focussing on superficial factors. We love the yellow colour of that sweater and ignore the fact that we don’t own a single piece that would go with it. We think that new line of workout clothes is so innovative and pretty, but ignore that we haven’t made it to the gym in four months. In short: We are not thinking things through properly because our focus is too narrow. The one thing that has really helped me in this area was developing a clear 5-question process to make sure I’ve really considered a piece from all angles before I buy it. If I can answer all five questions with a yes, the piece get’s a thumbs up and I buy it. If I can't, I put it back. The key is to have your questions prepared in advance, so once you are in the impulse-danger zone, you can just go through them without too much effort. The questions take some of the emotions out of the decision making and make everything a bit more objective. These are my five questions for potential new wardrobe items, but I also use this technique (with slightly tweaked questions) for things like buying home decor, beauty products, electronics and books.